Ann Arbor Mayor John Hieftje put his money where his mouth is tonight by writing a check to the city for $1,273. The donation represents 3 percent of his $42,432 salary - a voluntary pay reduction Hieftje is asking each of the city's labor groups to make in contract negotiations. 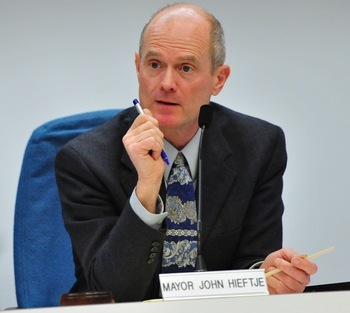 Mayor John Hieftje agreed to donate 3 percent of his salary back to the city tonight. Several Ann Arbor City Council members did the same, but others were hesitant. Hieftje's actions came as the Ann Arbor City Council voted tonight to ratify a new collective bargaining agreement with the city's firefighters union, which has agreed to a voluntary 3 percent pay cut to avoid layoffs for six months. "I think we need to respect what the fire department has done," Hieftje said. Hieftje's symbolic gesture was followed by announcements from several council members that they'd be willing to write a check to the city for 3 percent of their salary - or $477 each. Those who vowed to do so immediately included Carsten Hohnke, D-5th Ward, Tony Derezinski, D-2nd Ward, and Christopher Taylor, D-3rd Ward. Sandi Smith, D-1st Ward, agreed to give back 3 percent of her salary but acknowledged it's only a drop in the bucket. "We're not talking about something that's really going to shake loose the $5 million gap we've been talking about," she said, adding she hopes council members who agreed to give 3 percent back will be willing to be as strong when the council is faced with tougher decisions in the coming months. Sabra Briere, D-1st Ward, and Margie Teall, D-4th Ward, said they'd be willing to give back $477 over the next year, but weren't in a position to cut a check for the full amount right now. Teall said she'd make payments quarterly. Marcia Higgins, D-4th Ward, Stephen Kunselman, D-3rd Ward, and Mike Anglin, D-5th Ward, gave no indication during the meeting whether they'd be willing to give up any portion of their salaries. During a break in the meeting, Anglin told AnnArbor.com he wouldn't give any money back to the city but plans to make a donation to charity instead. Higgins said it was too early for council to agree to a pay cut when the rest of the city's labor force has not yet stepped up and made the same pledge. "I think it's fine that everybody wants to contribute back to the city - they must have the means. I don't," he said. "I have a son in college. I have twin 16-year-old daughters and a wife that's working a job with no benefits. Times are tough. I give back what I can. I drive a 20-year-old car." Stephen Rapundao, D-2nd Ward, said he'd be willing to consider the mayor's proposal, but said it will be a personal choice, and he hasn't yet made up his mind on it. Beyond the ceremonial gesture by council members tonight was the larger issue of the new contract with the firefighters union. Fraser said the new contract doesn't accomplish the city's short-term financial objectives for reductions in fire service costs, but is still a major step in the right direction. Fraser had hoped to save the city $396,000 over the next six months by eliminating 14 firefighter positions six months earlier than planned. But the city agreed to put those layoffs on hold through June under the new contract. According to CFO Tom Crawford, the contract changes - which include a 3 percent wage reduction for six months and a 1 percent increase in pension contributions for five months - represent a total savings of $151,250. Actions taken by management to eliminate one vacant firefighter position and institute a change in vehicle policy will save another $120,000. Fraser pointed out in an e-mail to council members before tonight's meeting that the fire department was spared any significant cuts in the last two fiscal year budgets, while police and other general fund service units took hits. "That recent budgeting history explains why reductions in expense were now expected in fire," Fraser said. "From an employee compensation perspective, these are the very first negatives the fire employees have faced while continuing to enjoy mostly unchanged contract terms. During the past two fiscal years, other city employees have experienced increased benefit costs, and pay freezes." The firefighters union says the pay cuts its member are taking - in addition to increased pension contributions - technically amount to a 4 percent reduction in compensation. Matt Schroeder, union president, said the city's firefighters are leading by example in responding to the mayor's call for voluntary pay cuts and hoping for the same from everyone in city government. According Crawford's estimates, the city could save $1.93 million in the next fiscal year if all of the city's labor groups followed suit and took a 4 percent cut in total compensation. About $1.1 million of that would be found in the general fund. The city also would save $5,814 if it trimmed Fraser's $145,356 salary by 4 percent. Fraser gave no indication tonight whether he'd be willing to take a pay cut, but has pointed out several times recently that he hasn't received a pay raise in several years - though he has gotten lump sum bonuses. Fraser was hired in 2002 with a salary of $133,000. In December 2004, he received a 3 percent raise retroactive to July 2004. In December 2005, he received a 3 percent raise retroactive to July 2005 and 10 extra vacation days, which can be exchanged for cash. In February 2007, he received a one-time payment of $8,479.48, plus a life insurance policy worth twice his salary. In November 2007, the City Council approved a lump sum payment of $4,361 and five extra vacation days. In October 2008, the council approved giving Fraser another lump sum payment of $3,634 and the ability to cash out 150 hours of vacation, sick or personal time. This past November, Fraser's contract was revised again to include a clause that allowed him to cash out an additional 120 hours of accumulated paid time off before June 30, 2010.